Bringing People Together With “Errors.” | Hark, villains! Hark, villains! The behind-scenes-blog of Bare Theatre and its affiliates. I’ll start this entry with a disclaimer. I love Netflix, watch it all the time. I hardly ever go to the movie theater anymore, and I don’t see nearly as many live shows as I want to. There, I said it. I don’t get out enough. However, I don’t think I’m alone in this respect, and that is a little sad to me. I think live entertainment used to bring people together more. Obviously back in Shakespeare’s time people had to see entertainment live because they couldn’t get it any other way. I think it’s kind of neat to imagine the crowds that gathered at The Globe – up to 3,000 people attending one show. People from all walks of life, rich and poor, all gathered to see plays that are still being performed today. 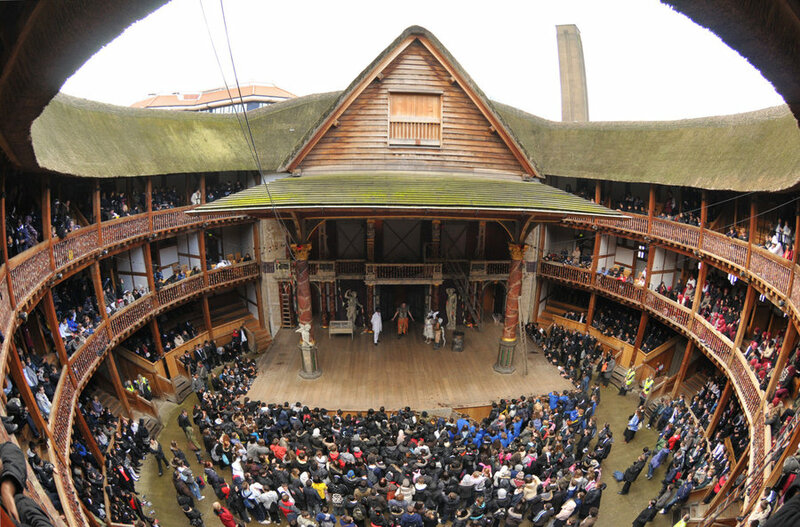 The reconstructed Globe theatre in London. The actors and the audience members who could afford better admission got sheltered seats with a roof over them. Those who couldn’t, “the groundlings,” had to stand at the bottom. If it was raining, they stood watching for about four hours…in the rain. Not many people would watch a play in the rain today (although Heather did – at The Globe!). Sure, we don’t have to, but the shift in attitude towards live theatre is pretty striking. This got me thinking: what events bring people together like this nowadays? Pop music concerts and sporting events, right? I once stood in pouring rain with thousands of other people at Raleigh Amphitheater to see Fleet Foxes (totally worth it! ), but that’s a pretty rare thing these days. Could drama bring members of the community in Raleigh and the Triangle together? I’d like to think so, especially after seeing the crowds at Shakespeare productions at Koka Booth Amphitheatre the last three years. The folks who built the outdoor stage at Raleigh Little Theatre back in the late 1930’s must have been dreamers. The formation of RLT and its construction during the depths of the Depression are testaments to the power of people whose imaginations conquered harsh financial and practical realities. They succeeded in building an amphitheater at one end of the old State Fairgrounds race track – and now that space stands ready for our imaginations. My goal is pretty simple. I want people to give Shakespeare a try because I think many of them will like it, just like we do. Errors is the shortest play we have from Shakespeare (a mere 1,787 lines compared with Hamlet’s 3,800+ lines). It is not a heady play by any stretch. It’s a broad farce with a ridiculous premise (what are the odds of two sets of twins both having the same name?). It’s accessible. Does this mean it’s not worthwhile to perform? I say no, because it’s still a fun play. It’s funny today because we all understand the humor. Errors is a situation comedy and we can all enjoy watching the chaos that unfolds. With circus added in, I’m hoping to make this more than a play. I’ll defend spectacle in addition to broad comedy because I think it does have its place. From what I’ve seen of Cirque de Vol and their surrounding circus collective, these performers are artists and they spend a lot of time working on their craft. What we will create with them over the next two months will hopefully be a fresh and rollicking rendition of this early Shakespeare text. I’m taking for granted that it will rain at least a couple of the performance nights. If we can get a night or two without rain, the North Carolina weather in late May should be warm and inviting. People can bring their children to this show, pack a picnic or grab some concessions or food truck treats. There will be comedy and there will be spectacle. Hopefully, this will be a dream that we can share together. This entry was posted on March 22, 2013 by Bare Theatre. It was filed under circus, outdoor theatre, Raleigh, Shakespeare, why theatre matters and was tagged with amphitheater, Cirque De Vol Studios, Comedy of Errors, Raleigh, Raleigh Little Theatre, Shakespeare, The Globe, theatre.